Kings on Cards and Math. Did any one use the ‘T’ word ? Three Muslim university students were gunned down on Wednesday in North Carolina, United States. After seeing the ‘breaking news’ alert on my phone, from the UK’s Independent newspaper, I switched on the TV to tune in to CNN. Nothing there. Instead, I saw a suitably stern Christiana Amanpour in conversation with French journalist Didier Francois about the latest Isis terror. Then I turned to the old, ever dependable Beebs. Nothing there, either. Not even on the ‘fair and balanced’ Fox News or our own Al Jazeera. In fact, the news about the shooting of the family of three, Deah Shaddy Barakat, 23, his wife, Yusor Mohammed, 21, and her sister, Razan Mohammad, 19, all students of North Carolina University, in their home trickled down on wires much later. And even when it did, the response from western and international media outlets was limited and understated. No ‘Terror Alert’! No screaming headlines about the attack or minute-by-minute, live coverage. President Obama did not rush to condemn the killings as he did following the recent attacks in Paris and elsewhere. As far as I know, the White House has yet to issue a formal statement on the killing. Much of the US and western media has played down it as a ‘petty crime over a petty issue’ like parking. An Associated Press report wondered if the killing had anything to do with ‘hate.’ It answered its own question saying the killer Craig Stephen Hicks, 46, described himself as a ‘gun-toting atheist’ – as if that explained the killings. So there you have it. It was a minor parking issue. It wasn’t even a hate crime, it seems, let alone a terror attack. As someone quipped on Twitter, terrorism happens only if Muslims go berserk. Comparisons are odious. But if all lives are equal in the eyes of the world, why do we not see the same global outrage and outpouring of grief and solidarity with the victims that one witnessed following the Charlie Hebdo carnage? Where are the self-righteous statements from London, Washington and Paris, condemning the act of terror in this case? What about the ‘freedom and democracy’ of those killed in North Carolina? Were they any less human? What makes the killing doubly tragic is the fact that the couple had only recently met, during a fund raiser for the Syrian refugees, briefly dated and married. The younger girl was visiting them. They were like any other regular American family. So why doesn’t their murder provoke the same response as other such killings and attacks have? Truth be told, some are more equal than others, as Orwell would argue. Especially in these perilous times when the whole world seems to have gone stark, raving mad. Islamophobia in the west and around the world has touched unprecedented, alarming proportions. A new USA Today cartoon, picked up from a regional publication, this week portrayed Muslims as the new Nazis and Islam as equivalent of Hitler’s sick, jaundiced worldview founded on hate and hubris. Few eyebrows were raised though. It seems it’s now perfectly okay and cool to wear Islamophobia and, worst, racial and religious prejudices on your sleeve and get away with it. So given the sweetness and light that is spread around these days by western media narrative and even by responsible, elected leaders, targeting a particular people and faith for all sins imaginable, should you be surprised by these killings? On the other hand, can you really blame the world if Islam and Muslims these days find themselves under fire everywhere? The shenanigans of those like the Isis, Al-Qaeda, Boko Haram and the Pakistani Taliban, all in the name of the blessed faith of course, do not just repeatedly shame Muslims, they have played a critical role in fuelling the mistrust, hatred and demonisation that the faithful face across the world. One incident like the Peshawar school massacre is enough to boost their already shining image. Even from its own glorious standards of savagery that the Isis has established in a very short time, the manner in which the Jordanian pilot Maaz Al Kasasbeh was dealt with – caged, burnt to death and bulldozed – was truly diabolic and horrific. What faith can sanction and condone such satanic acts of revolting brutality? Certainly, not ours. If these people can do this to a Muslim, imagine the potential of their intolerable cruelty against those considered beyond the fold. And how do Muslims expect to be viewed around the world after such bouts of casual, spine-chilling savagery by folks who claim to speak and act on their behalf? There are bound to be repercussions. Of course, the tiny lunatic fringe that is Isis and groups of its ilk do not and cannot represent a great faith with 1.6 billion followers and a long and proud history of tolerance. Persecuted minorities like the Jews found refuge in Islamic Spain and Turkey when they were being hunted like animals all across Europe. Top Islamic scholars have repeatedly rejected and condemned the extremist violence in strongest terms. In September, more than 120 Islamic scholars and clerics wrote a letter to Isis denouncing it and its invoking of Islam to justify its shameful actions. But clearly Muslims have to do more to confront the mindset and conditions that give birth to such nihilist extremism on the one hand and present the real face of Islam before the world on the other. We have to speak out more often and more forcefully and effectively to reject the barbarity, death and destruction being visited on the world in our name. How can anyone kill in the name of a faith that came as a blessing for the whole of mankind and preaches oneness of humanity? It’s the ultimate calumny and injustice to a religion that literally means ‘peace and salvation’. For their part, western societies need to do their bit to check the growing vilification of Muslims and other minorities in their midst. All said and done, it is not religion or dogma but historical injustices and double standards that lie at the heart of this conflict. Extremism and violence are born and thrive in the soil of injustice and oppression. Unless these are addressed, all grand solutions and coalitions will fail. The writer is a Middle East based columnist. British man said, ”Of course no, there are only certain people who can shake hands with Queen Elizabeth”. 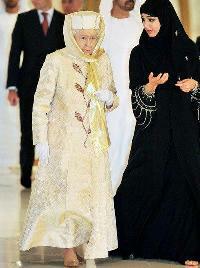 Sheikh replied, ”Our women are queens and queens do not shake hands with strange men”. The British replied, ”The covered one”. The Sheikh said, ”That’s how we treat and see our woman”. ‘The press is so powerful in its image-making role that it can make a criminal look like the victim and a victim look like he’s the criminal’. These words, said by Malcolm X, the icon of African Americans’ struggle for dignity and justice, still ring true four decades on. In fact, they are all the more relevant today when spin has been perfected as an art form by the likes of Thomas L Friedman. The popular New York Times columnist and old hand on the Middle East is one of the most powerful spinmeisters of the US establishment. He is one of those incredibly gifted pundits and opinion-makers who can make victims look like oppressors, justice as injustice and truth as falsehood. These people can turn logic, reason and facts upside down and get away with murder. This is spin at its best. So it is the Palestinians’ fault, that Israel has occupied their land, continues to kill their men, women and children and shuts them off from the rest of the world by building a barrier on their own land. Blame the victims for the injustice inflicted on them. This is what Israel and its friends in the US establishment have successfully done for the past half a century. So if the persecuted, besieged and utterly helpless Palestinian kids and teens blow themselves up, it is their own fault, of course. What forced Fatma al Najar, a Palestinian grandmother and all of 64 years, to take her own life near an Israeli patrol? Many in her family had come in the line of fire of Israel’s brave soldiers and her old family home had been destroyed in Israeli bombing. Yet, in the eyes of Friedman and people of his ilk, if she killed herself in utter despair and frustration, of course she was herself to blame. The New York Times columnist has an imaginative solution to the nuisance that the Palestinians and Arabs represent. “Build a virtual wall. End our oil addiction. Hmm. So Arabs are now the ‘oil pushers’ – a la drug pushers. Now the Arabs are to be vilified and demonised for providing most of the world’s oil. So if the world is dependent on Arab oil for its growing energy needs, Arabs themselves are to blame. So while the world economy, including the US economy – with its gas-guzzling SUVs – runs on Arab oil, Arabs are to get brickbats for pumping it up at ridiculously low prices. And it is awfully nice of Friedman to propose the wall ‘insulating’ the US from what he calls ‘the madness of the Middle East.’ That would be really something! Makes sense too. For the Middle East, the cradle of civilisation, had not known what Samuel Huntington calls the clash of civilisations – until world powers came along. Who sowed the seeds of this conflict in the holy land in the first place? Who drove Palestinians out of their homes forcing them to wander forever across this ancient land? What is their sin, for which the Children of Israel continue to punish them? Defending the indefensible, Israel’s apologists clearly believe in Goebbels’ dictum that you can turn a lie into truth by repeating it ad nauseam. First you occupy Arab land using deceit, manipulation and force and then accuse them of being incapable of living in peace with Israel. These too-clever-by-half friends of Israel conveniently ignore the fact that it is not the Palestinians who have gone and occupied someone else’s land. It’s the other way round. And we all know what the civilised and peaceful Israel has done to the people it calls terrorists. In the most recent offensive on Gaza alone, more than 2000 Palestinians were killed and the largest prison on the planet was nearly totally destroyed all over again. The media can get away with murder. That is the power of spin. But are those at the receiving end in a position to complain? The Arab and Islamic world has done little so far to counter the brazen and unabashedly one-sided narrative proffered and perpetuated by those in the US media, much of it controlled by big business and Jewish moneybags. But why cry about the western media when the media owned and supposedly run by Arabs and Muslims itself is increasingly controlled and manipulated by those who have little empathy for their hosts or care little for their concerns and interests. Except for solitary and brilliant examples such as the Qatar-based Aljazeera, which has consistently punched above its height to offer the other side of the story employing a credible and objective voice and truly professional, word-class medium, there is a lot that needs to be done to restore a semblance of balance in the way the reality of the Middle East is presented in the global media. There is no dearth of resources and talent in the Arab world. What is needed is a vision and willingness to take charge of the narrative, if not the destiny. Why aren’t there more Al Jazeeras in the Middle East and around the world? If you pursue happiness, it will elude you.